There was a small fishing boat next to Ryoei-maru at which I always moor my boat. Then, I managed to move my boat into a narrow space of the other side of the fishing boat. The captain of the fishing boat made no complaint in a friendly attitude. Again, I moored my boat at the right side of Ryoei-maru (a fishing boat) toward shore. The captain , friendly to the yacht, took my dock line. Watch rickety wooden boards of the pontoon alongside the quay wall. When you step on a board, it could be easily broken. A good restaurant: “Udon Nochi” in front of A-COOP serves you a handmade delicious Udon noodle. because the time table changes depending on the day of the week. I was sailing toward the south end of Okikamuro-jima Island from the east. I faced rough waves and current as noted on the chart. It was a short period though, the bow leaned to either side as the waves heaved up. 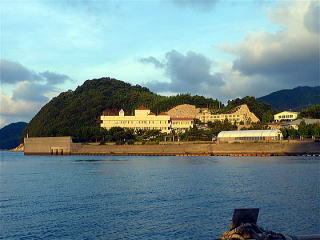 The closer to widely-surrounded Agenosho Bay, the calmer waves and winds were. The calmer weather calmed myself down. It was a strange feeling at Agenosho. While I saw some ports on the pilot book, I had not enough information on Agenosho. 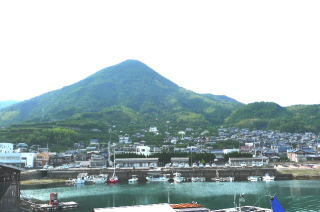 Then, I sailed toward Higashi (= East) Agenosho. on your left (= west) near the entrance of Higashi Agenosho. There is a straight line breakwater in front of the port entrance as shown on the pilot book. Then, you will see a red lighthouse at the right side of the entrance. In the port, there is a beach dead ahead of you. While there is a boat pool on your right side, the west side port on your left is deep enough and convenient. Turn to the left and moor bow to the quay at an open space on your right north side. When I approached, a fisher man onshore gave me a direction. It was helpful. People here are gentle and kind. The left side of my boat was a mid-sized fishing boat, Ryoei-maru. The right side was a small pressure boat without boat name. Next to the pleasure boat is another Ryoei-maru which is owned by another brother. 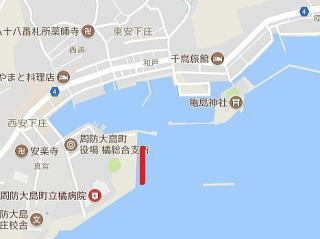 While there is an open space in front of moss-green Nokyo (Agricultural Coop) building at the innermost of the port, it is shallow. Here is Seto Inland Sea. The tidal difference is 3.5 meter, two days after the spring tide. Not to go aground, you need an enough depth. There was a sail boat mooring here in the past though. You may also moor at the boat pool in the right of the beach. 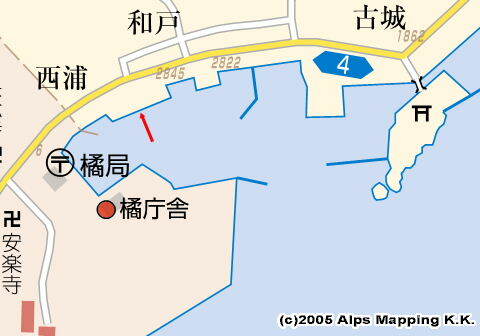 There are other ports in the east of the boat pool and Nishi (= West) Agenosho under different jurisdictions. Higashi Agenosho looks most gentle and kind. There is a public toilet one minute walk away from the quay. I like a western style toilet in a park at the opposite shore. Water from the toilet. A Nokyo supermarket is three minute walk away. Fuel is at gasoline station ENEOS. Ryuzaki Onsen is available with JPY700 and 20-30 minute walking.